This flood has additional significance, because the devastating impacts led to multiple changes in policy and infrastructure related to water management in the Netherlands. On February the 21st, 1953, the Deltacommission was founded to devise a plan to guide these changes (Deltawerken, 2017). 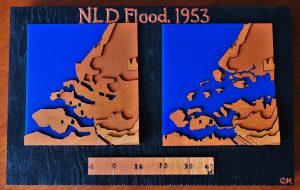 Both models were created to represent only the areas surrounding the flood extent – which was centred in the province of Zeeland (appropriately translates to English as “Sealand”). Two spatial datasets were used to create the models: elevation and land cover. Elevation is extremely relevant to the 1953 flood due to the increased vulnerability of low-lying areas – it is much easier for these areas to flood that those with higher elevations. The MODIS (2015) elevation raster was used to represent elevation. A land cover raster (Landscan, 2015) was used to determine the “normal” extent of the North Sea – used in the pre-flood model. While the extent of the North Sea was likely slightly different in 1953 than in 2015, spatial data was difficult to come by for this time period – due to the fact that the flood took place over 50 years ago along with difficulty navigating open data portals written completely in Dutch! Therefore, the 2015 dataset was used to provide a general representation of the North Sea extent. Additionally, one non-spatial image was georeferenced to define the flood extent. The historical time period that the flood took place also made it difficult to obtain spatially-enabled data of the flood extent itself. I contacted an employee at the Dutch Open Data Portal, and was pointed to multiple PDFs outlining the flood extent in great detail – and again, written in Dutch. Because these images were so hard to decipher, I opted to use a basic JPG image of the flood extent that was made available on the Deltawerks website (http://www.deltawerken.com/Devastating-Powers/484.html). This image was used to define the flood extent. These datasets needed to be processed, and then exported into a format which could be used as an input for the laser-cutting machines. The first step in this process was to transform the JPG flood extent image into a spatially referenced polygon. To do this, provinces in the Netherlands were selected by eyeballing the approximate extent of the flood. From this selection, the ‘minimum bounding area’ tool was used to output a rectangular polygon which would encompass all of the selected area. In order to “cut” the flood extent from this rectangular polygon, the JPG image showing the flood extent first needed to be geocoded. The image was imported into ArGIS Pro – and initially appeared to be “floating in space” because it had no spatial information associated with it. To resolve this, multiple georeferencing points were added to match identifiable points on the JPG image to the same points on the exiting base map. Approximately twenty georeferencing points were added before the JPG image appeared to line up with the base map underneath. Finally, the geocoded image was made transparent, and used as a guide to edit the rectangular polygon to form the shape of the flood extent (using the “cut” editing tool). The flood extent data for the “post-flood” model was complete! The second step in this process was to define the “normal” extent of the North Sea in the study area. To do this, the elevation raster was used. The raster was first clipped to the same rectangular study area polygon previously used to create the flood extent. After the raster was clipped, all pixels identified as being water were extracted. Then, the raster extraction of water pixels were converted to polygon. Because the polygon was created from individual pixels, the resulting edges are very jagged. The “smoothing” tool was run on the sea extent polygon, which resulted in something that would be much more visually appealing in the model. The result represented the North Sea extent “pre-flood”. The third step in the process was to manipulate the elevation data. Like the land cover raster, the elevation raster was clipped to the rectangular study area polygon. Then, elevation values needed to be reclassed. Reclassing the raster simplified the data in a way, so that it would be possible to construct using laser-cutting. The raster was reclassed into five classes: -6 – 0 m, 0 – 10 m, 10 – 20 m, 20 – 30 m, and 30 – 40 m. This reclassed raster was then converted to a polygon, with the ‘simplify’ option elected. Graduated colours was selected for symbology of the resulting layer, so that you could intuitively tell which layer had the lowest to highest elevation. A copy of the polygon elevation layer was made, so that one existed for the “pre-flood” model and for the “post-flood” model. For the “pre-flood” model the erase tool was used, inputting the normal North Sea extent as the erase feature and one of the elevation polygon layers as the target feature. This was repeated for “post-flood” model, but instead the flood extent polygon was inputted as the erase feature. Now, both elevation datasets were complete! These layers were shown on the layout view of Arc individually, and exported as PDFs (seen below). PDFs were requested by the company that I had contacted about running the laser cutting process. After reviewing my project with the external company, I sent them my PDF files and discussed potential materials. We decided that using 3 mm wood would be a good choice in material for the elevation component – it would show the difference in elevation by layering but also would not be too expensive. For each increase in elevation class, and additional layer of wood would be cut to stack onto the one below. This would make the result 3D in nature, and make differences in elevation really stand out (especially since the Netherlands is so flat!). We also decided that using a blue Plexiglas would make the sea and flood extent be visually appealing and really stand out. 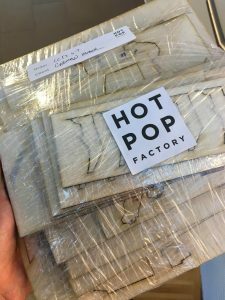 I received the laser cut materials in a package, as shown in the image below. Laser-cut wood and Plexiglas picked up! When the cutting was complete, I stained the wood using a decreasing number of coats as the elevation layer increased. Then, I assembled the pieces on a wooden base using wood glue and double sided tape. I added a legend indicating the elevation range for each level. Looking back, there were a few things I would have done differently to improve this project. First, the model would have been more interesting if I had found historically accurate data sources for 1953. Additionally, the models would have been more accurate if I had somehow incorporated the locations of the storm barriers and/or dykes that failed during the flood. Second, the final product might have been more visually appealing if I had used a greater number class breaks to represent elevation. This would have provided more detail on the elevation of the study area, and would have made the models look better in general. Third, I could have improved minor details (such as the title) to make the final product look more polished. Despite these potential improvements, I was happy with the result! 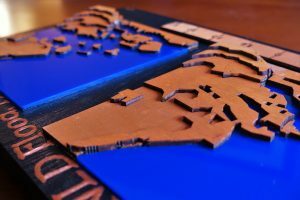 I discovered that laser-cutting is an effective technique to create visually appealing spatial models.